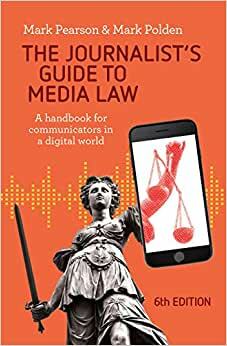 A practical guide for journalists, public relations and marketing professionals, bloggers and social media experts to staying on the right side of the law. We are all journalists and publishers now: at the touch of a button we can send our words, sounds and images out to the world. No matter whether you're a traditional journalist, a blogger, a public relations practitioner or a social media editor, everything you publish or broadcast is subject to the law. But which law? Whether you work in a news room, in public relations or marketing, or blog from home, make sure you have The Journalist's Guide to Media Law at your side. Start reading The Journalist's Guide to Media Law on your Kindle in under a minute. MARK PEARSON (BA, DipEd, MLitt, LLM, PhD) is Professor of Journalism and Social Media at Griffith University in Queensland, where he is a member of the Griffith Centre for Social and Cultural Research. He is author of Blogging and Tweeting Without Getting Sued (Allen & Unwin, 2012) and co-editor of Mindful Journalism and News Ethics in the Digital Era: A Buddhist Approach (with Shelton A. Gunaratne and Sugath Senarath, Routledge, 2015), and Courts and the Media: Challenges in the Era of Digital and Social Media (with Patrick Keyzer and Jane Johnston, Halstead Press, 2012). He has worked as a journalist with several media organisations, including The Australian. He blogs from journlaw.com and tweets from @journlaw. MARK POLDEN is a Sydney barrister. After ten years in the media law practice group of a national law firm, and then as in-house counsel for Fairfax Media for the best part of two decades, he now advises and acts for Australian and international print, broadcast and online media, film and television production houses and for private clients.